The flavours of Mexican cuisine make these a hit. Nothing’s easy… But the times we learn the most is when difficulty arises. By the way, these wraps aren’t difficult, just me arriving at the name. They’re made of leftover bits that were hanging around in my refrigerator. 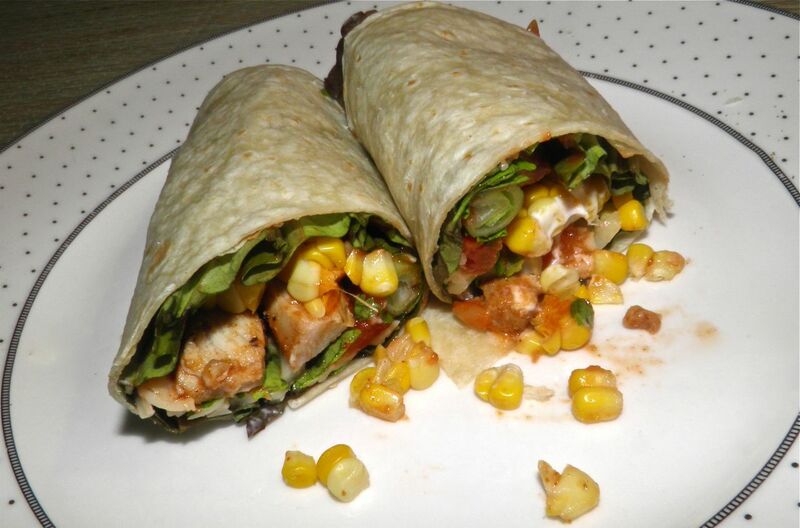 Leftovers Wraps. It doesn’t make you salivate in anticipation does it? Since these wraps turned out to be very Mexican in taste I though the least I could do is fancy up the name to reflect their "ethnicity." So I asked Google what I thought was an easy question: What’s the Spanish word for “leftovers”? To my surprise there’s where the difficulty began. 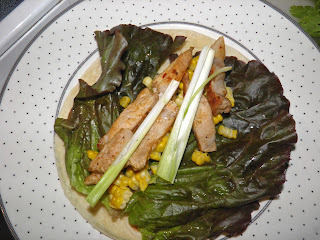 Tortilla, lettuce, corn, pork, cumin and onion. Although “sobras” is the term, I don’t believe it is exactly correct to use it the way I have in my blog post name. From what I have learned you really don’t just say “leftovers” in Spanish. For one, the word is used in context. Rather than leftovers, in general, it is often specific. For example, “usamos el pavo que había sobrado”; “we used up the leftover turkey.” Sobras is the plural noun, sobrado is the adjective. For another, where the leftovers originated from may determine the word you use as well. “El recalentado” are specifically leftovers from a special dinner like Christmas or a wedding. If you use “recanlentado” you have to specify from what sort of dinner, much like above you had to specify what sort of leftover meat. Further, there is “restos”. Those are leftovers, but they’re like bones, skin, peels and other stuff. You wouldn’t eat restos wraps. If you did you would probably be called a “vagabundo” (hobo). Regardless, back to the wraps. I had some pretty specific, but not uncommon, leftovers. The Superstore had 10 ears of corn for $2.00 a few days ago – local corn too. Yum. We didn’t eat it all. I also had three pork chops left over, a bit of Monterey Jack cheese, some cilantro and – wonder of wonders – salsa. We are always throwing out salsa. There’s 2 of us and our favourite salsa is sold in 650 ml jars. It’s Sobeys brand Fireball Salsa. For those non-Atlantic Canadian readers, Sobeys is a local grocery chain. Their branded cuisine is not usually their strong suit. But the salsa is good, if a bit runny. It’s so hot you don’t need anything else in the wraps for spiciness. So essentially I went foraging in my refrigerator for foodstuffs I needed. I had to purchase a lime, some sour cream and lettuce. Oh, and the tortillas. I hate buying tortillas. They cost a fortune for what they are. I think I’ll post a homemade how-to recipe some time soon. How hard can they be? ...salsa, cilantro, sour cream and Monterey Jack. Cut the pork into manageable pieces and toss with some taco seasoning and lime juice. Preheat the oven to 375°F. Line a baking tart with foil and lay the corn kernels and pork out in a single layer. Bake for 20 minutes to reheat the pork and partially cook the corn. Wrap the tortillas in tin foil and place in the oven for the last 10 minutes to slightly steam. 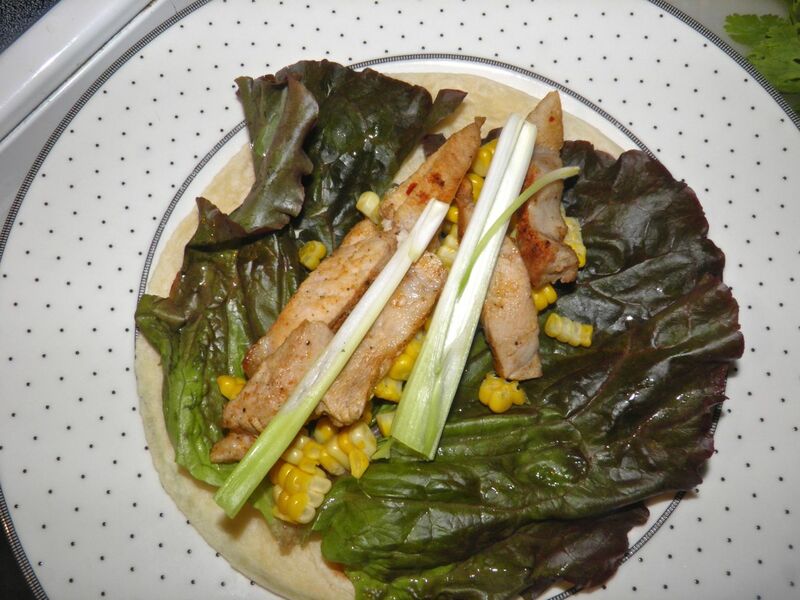 To assemble, place a lettuce leaf on the bottom of a tortilla, then add pork and corn. Sprinkle with cumin to taste. Add a lot of torn cilantro, some salsa and sour cream. Add onions if you wish. 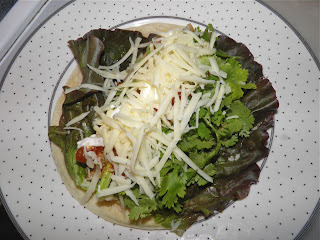 Grate cheese on top and wrap up. That’s it. A great way to use some sobras from your ‘fridge.